This tutorial shows how to use "VeryDOC XPS to PDF Converter Command Line" to convert an XPS file to a PDF document. "VeryDOC XPS to PDF Converter Command Line" is a best XPS to PDF Converter that allows creating PDF files from XPS files on the fly. VeryDOC XPS to PDF Converter Command Line is a standalone application, it doesn't require Adobe Acrobat or Adobe Reader installed in the system. It's an native XPS processing, fast and precise. XPS (XML Paper Specification) is a fixed file format developed by Microsoft similar to PDF but based on XML instead of the PostScript language. 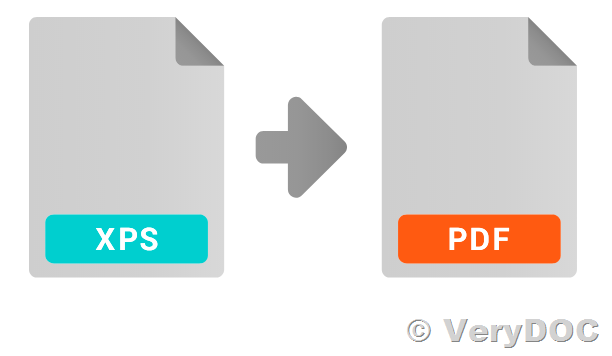 By installing VeryDOC XPS to PDF Converter Command Line you can easily convert XPS files to PDF documents. 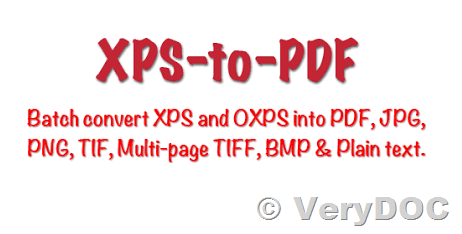 XPS to PDF Converter does convert XPS files to PDF, EPS, PS, BMP, TIFF, JPEG, PNG, PCX, etc. formats. -useprinter option will print XPS file to a Postscript Printer first, and then convert from Postscript files to PDF files again, this option will maintain original contents and layout between XPS and PDF files completely. VeryDOC XPS to PDF Converter Command Line is a great software to convert from XPS files to PDF files without any third-party software installed, you can just download and try it for free. 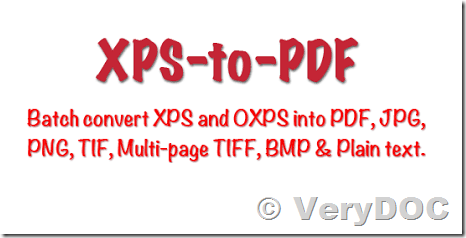 How to convert xps to pdf offline? VeryDOC XPS to PDF Converter Command Line software can be used easily to convert from XPS files to PDF files. Besides saving to PDF, it also converts multiple XPS files to image formats, such as JPG, TIFF or PNG. 1. Install a Virtual Postscript Printer into your system first. 2. Print XPS file to this Virtual Postscript Printer to create a PS file. 3. 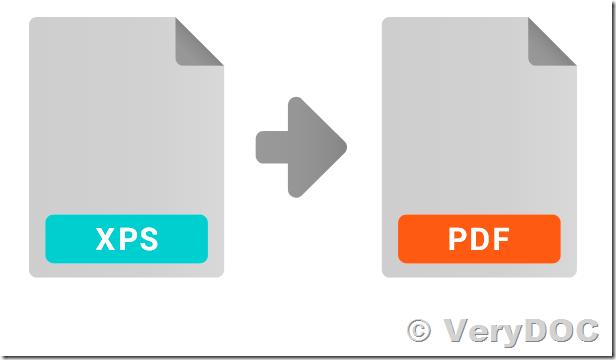 Convert the PS file to PDF or other formats. "-useprinter" is a great option and it can maintain the contents and layout from original XPS files perfectly. "-useprinter" option will install a "VeryPDF Postscript Writer" virtual printer into your system, so you need use administrator privilege to run xps2pdf.exe application when you use "-useprinter" option, xps2pdf.exe will fail to install "VeryPDF Postscript Writer" virtual printer if it hasn’t administrator privilege option. Without use of "-useprinter" option, VeryDOC XPS to PDF Converter Command Line software will parse the every elements from XPS file and write them to PDF file one by one, the speed of this conversion process is very fast. If you encounter any problem with VeryDOC XPS to PDF Converter Command Line software, please feel free to let us know, we will assist you asap. XPS Document Format: Open XML Paper Specification (also referred to as OpenXPS) is an open specification for a page description language and a fixed-document format. Microsoft developed it as the XML Paper Specification (XPS). It is an XML-based specification, based on a new print path (print processing data representation and data flow) and a color-managed vector-based document format that supports device independence and resolution independence. In Windows 8 .xps was replaced with the ECMA standard .oxps format which is not natively supported in older Windows versions. also looking for compatibility - windows 10, windows 7, Server 2008, 2012, 2016 etc.